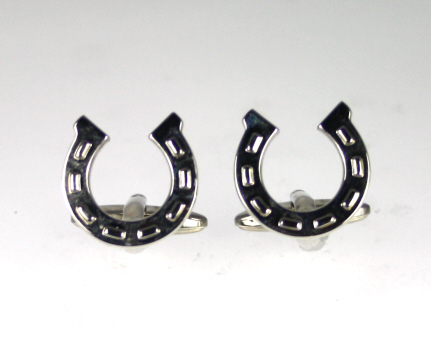 A lucky pair of horseshoe cufflinks! Good gift for horse racing fans, equestrian lovers, gamblers, wedding outfits or anyone else who needs good luck! A 'Pointers of London' ceramic horsehead trinket box. A large cream china mug with a saddle and riding crop and large letter word 'riding'. Great gift for those who love this popular sport. A smart horse racing tie with a horse and jockey embroidered motif on an olive green necktie. Made in the UK.